I did an interview on Heritage Radio Network today (Sunday), talking about food blogging and Southern Italian cooking. Listen to it here. Where was this photo taken? Those iron railings on the balconies makes me think Sicily. 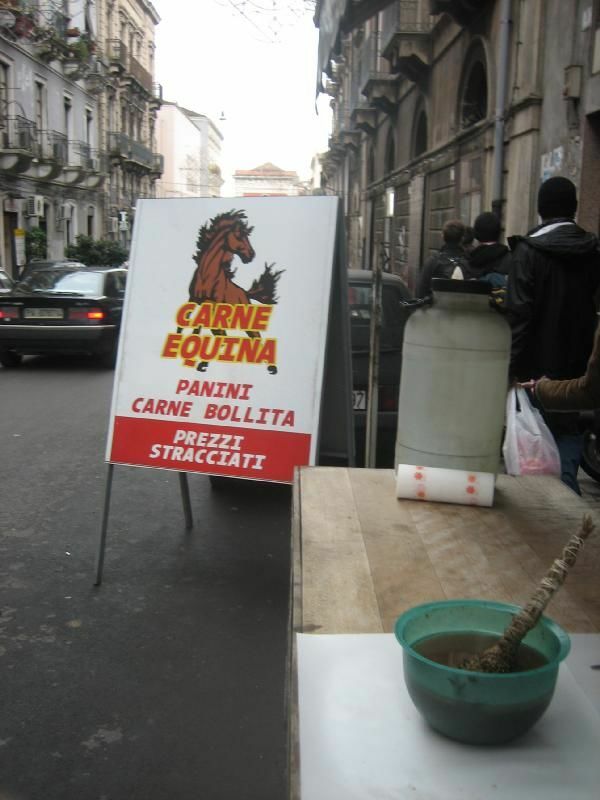 Only Italian city I’ve been to that seems gaga over horse meat is Padova. In the market there were a couple of butchers specializing in horse meat and it appeared on a lot of restaurant menus. It’s where I added a type of meat to my “I’ve eaten more mammal species than anyone” list that almost no one else has…donkey. It was quite a delicious stew. You know, I don’t know. I found the photo on google image search and fell in love with the plastic bucket of brown sludge with the twig brush stuck in it. Really appetizing. It might be Sicily. I saw lots of horse butcher shops there, and in the outdoor markets. Not sure though.